Parking.com has convenient parking for Saint Louis Ballpark Village. Refer to the map listings for more information on nearby parking or to reserve a guaranteed space. 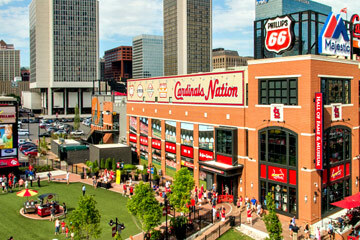 Ballpark Village is the newest dining and entertainment district in the St. Louis region. The village is located next to Busch Stadium, and is the first ever sports anchored entertainment district to offer food, drinks, and a great sports viewing experience.